Mohamad Mohamad Abdi was arrested on for utilizing a vehicle as a weapon to attack people outside of a Los Angeles synagogue. MELROSE—Mohamad Mohamad Abdi, 32, of Seattle was arrested by officers from the Los Angeles Police Department on Friday, November 23 at 9:35 p.m. for assault with a deadly weapon with a vehicle and a hate crime enhancement. He was booked on Saturday morning, November 24, 2018 at 3:50 a.m. According to the LAPD, Abdi, a Somali immigrant, is accused of attempting to hit individuals outside of Congregation Bais Yehuda, a Los Angeles synagogue, in the 300 block of La Brea Avenue at Oakwood Avenue on Friday. The Los Angeles Police Department indicated that prior to trying to hit two men outside of the synagogue, Abdi is accused of yelling out anti-Semitic insults and slurs. According to a statement by LAPD Deputy Chief Horace Frank to the Los Angeles Times, Abdi was driving a rental car as he yelled out profanity and slurs at a group of worshipers standing outside. Two men who were alarmed by his actions moved away from the larger group while maintaining an eye on Abdi. The suspect made a U-turn and ran a red light and proceeded to accelerate towards the two men. Both individuals were able to move out of the way of Abdi, who crashed into a parked car. LAPD Chief Michael Moore stated in a press conference on Monday that, “that monitoring, that vigilance, saved their lives.” No one was injured at the scene. Abdi is being held at Men’s Central Jail in downtown Los Angeles. He is being held in lieu of a $55,000 bail. While a knife was found in Abdi’s rental car, authorities do not believe that he possessed any firearms. Federal prosecutors may consider pressing possible hate crime charges against Abdi or domestic terror charges. The Los Angeles County District Attorney’s Office indicated that the defendant faces a possible maximum sentence of 8 years and 8 months in state prison if convicted as charged. 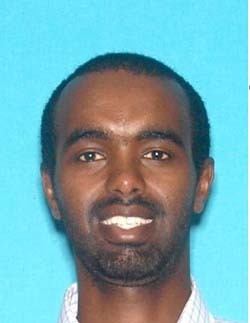 Detectives have released Abdi’s photograph; if there are additional victims of crimes committed by Abdi they are asked to contact LAPD Major Crime Division 213-486-7220. During non-business hours or on weekends, calls should be directed to 1-877-LAPD-24-7 (1-877-527-3247). Anyone wishing to remain anonymous should call the L.A. Regional Crime Stoppers at 1-800-222-TIPS (800-222-8477) or go directly to www.lacrimestoppers.org. Tipsters may also visit www.lapdonline.org, and click on “Anonymous Web Tips” under the “Get Involved-Crime Stoppers” menu to submit an online tip. Lastly, tipsters may also download the “P3 Tips” mobile application and select the L.A. Regional Crime Stoppers as their local program.